Falling in love with Colombia is easy. Leaving is near impossible. The people are welcoming, great swathes of the environment remains untouched and the culture and dance prove intoxicating. It won’t be long before Colombia is a tourist Mecca so go soon before the best kept secret is out. Years of conflict have left huge areas of this country in its natural state, providing a stunning array of national parks to visit and so many secret spots to escape to off the beaten track. Security has vastly improved in the past decade and the welcoming people of Colombia are wanting and ready to embrace visitors. Find out my Top 10 recommendations for Colombia. The North Western Caribbean coast has enough to keep any traveller occupied for weeks. With a stunning beachside national park, jungle covered archaeology sites and colonial towns, there is something here for everyone. Caño Cristales is a river unlike any other in the world with its display of reds, pinks, whites and greens making this a natural wonder. Between June and November each year, the aquatic plant Macarenia Clavígera blooms to blanket the riverbed in colour. The best time of year to visit is August and September when the colours are at their most diverse and it rains less. Read More. Bogota actively encourages street art, attracting artists from across the globe and many are paid by shop owners to colour facades. Much of the art carries a political message and the artists are as diverse as their murals – with one a university architecture professor. Read More. Cali: Party is Cali’s moto and dancing is its soul. Cali lives and breathes salsa and on almost every corner you can find a dance studio or salsa bar. Some 800km off mainland Colombia are the aqua blue waters and white sandy beaches of San Andrés and Providencia (Old Providence). Located close to Nicaragua, these islands have a fascinating history, having been claimed by Nicaragua, Britain, the Dutch and Colombia, and raided by pirates. Here, the culture is more Caribbean than Colombian; Creole is the main language and is based on English, and the locals are very proud of their English routes. Read more. A short taxi ride from town is the Cocora Valley and its beautiful hiking that take you through a cloud forests, crossing creeks on swing bridges to a hummingbird garden and the 30 metre tall wax palm trees. These trees are native to the Colombian region of Quindio and are the country’s national flora symbol. Read more. The beautiful whitewashed town of Villa de Leyva is a gorgeous place to spend a few days visiting its ancient fertility and calendar site, waterfalls and mountains and mixing with the locals. A shortish walk from town is Little Hell (Parque Arqueológico de Monquirá El Infiernito) where you can see a giant stone “phallic forest” spread across a field and an astronomical site. We stopped there to enjoy the interesting 2200 year old Muisca archaeology and lunch. Read More. 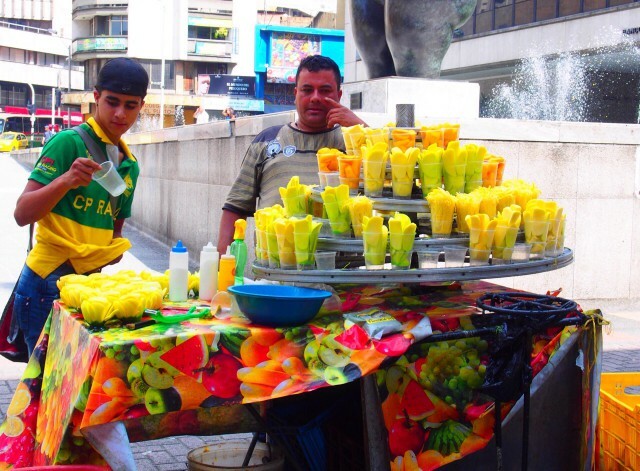 Medellin was once the most dangerous city in Colombia, but it is hard to find any remanence of that time, with people super friendly, the city clean and a party vibe emanating on almost every corner. Read more. Could Manizales be the friendliest places on earth? Strangers stopped me in the street to talk and a taxi driver turned off his meter to give a tour of town, it was a wonderful welcome to “dangerous” Colombia. Rolling hills, deep canyons, waterfalls and 3500 year old archaeology make San Agustìn in southern Colombia a must visit town on any backpacker’s list. The UNESCO listed archaeological park is impressive with more than 500 large tombstones dotting the landscape. The UNESCO listed archaeological park is impressive with more than 500 large tombstones dotting the landscape. But it is another tourist attraction that has many travellers visiting, a tour that takes you inside the country’s cocaine industry. Read more. The San Blas Islands must be the Hollywood shoot location for every pirate movie ever made. More than 400 islands with white sandy beaches and coconut trees dot these stunning Caribbean waters and can be reach by sailing and speed boat tours from Cartagena and Capurganá in Colombia or Panama City. Our tour took us to uninhabited islands where we ate lobster and fish and broke open coconuts to drink. Our beds were hammocks, the entertainment – a bonfire and guitar on the beach. Read more.